The Famicom Disk System may offer games that saved to disk and enhanced music and sound effects, but it came at a cost. The disks can fail, the drives' belts can snap and the disk system introduced loading times to the Famicom platform. With devices like the FDSStick, the first two issues have been eliminated but the last issue remains. Here I am going to list all Famicom disk system games with a later port to NES or Famicom cartridge and determine whether the extra features (if any) are worth the drawback of putting up with loading times. Bold means that there is in-game Famicom Disk System Expansion Audio music, which is rare. 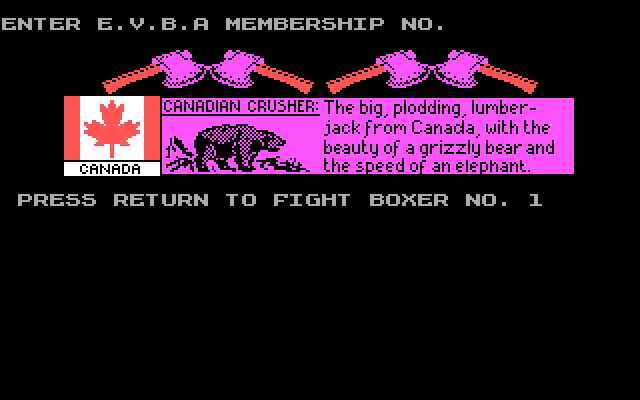 The NES has quite a few good two player games. When you have a friend over and want to play the NES, it would be nice to have a good game or two ready. However, two player alternating games are not much fun when you are watching the other person play all the time. Not all two-player simultaneous games are great either. Here I am going to give my recommendations for good two player simultaneous NES games. Since I am not a big sports fan, I am excluding those games. Archon is like Battle Chess without the strict chess rules. It is a port of the Atari 8-bit game. Each player gets a nearly mirror image set of "pieces" to use, one side representing the Light and the other side representing the Dark. 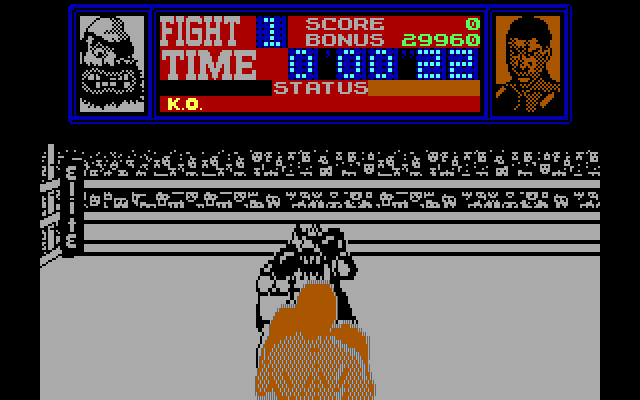 When a piece enters the square of an opposing piece, the players control the pieces in an arena and fight to the death. You can win the game by controlling all five squares or by killing the enemy wizard/sorceress. The various pieces have different strengths and weaknesses. Some pieces have a melee attack, some have a ranged attack and some have a touch attack. The color of the board and some of the squares shifts between light and dark, giving the favored side an advantage. The wizard and sorceror have some one-time use magical spells. As a one player game, the AI is exploitable and cheap, but two players can have a lot of fun with this game. The game is easy to pick up and play and there is plenty of strategy to be employed. Balloon Fight is essentially Nintendo's clone of Joust. The object of the game is to break your opponents' balloons by landing above them. Then you have to kick them off the platform, otherwise they will inflate another balloon. You have to dodge lightning sparks and the computer enemies. Be careful, you can break your friend's balloons just as easily as you can an enemy's. It's pretty simple, but the late Satoru Iwata's classic really captures the spirit of Joust. The control is easy to grasp yet hard to master, like all good Joust ports. Its even better than the official Joust NES port. In 1980 Radio Shack released its budget line of computers with the Tandy TRS-80 Color Computer. Originally priced for $399.00 for the base model, it came with a 6809 CPU running at .894MHz, 4K of RAM and could display only upper case characters. It could be expanded to 16KB, then 32KB and finally 64KB. It had a built-in BASIC, a cartridge slot, two joysticks and a 53-key keyboard. Its most often used graphics mode was a 256x192 artifact mode capable of four primary colors (black, white, blue and orange). It used single sided, double density 5.25" drives that held 156,672 bytes per side for user data using Radio Shack DOS. Its sound hardware was a 6-bit DAC and it had a serial port and a cassette port. The Color Computer 2 was essentially the same machine with a better keyboard and more easily expandable RAM. Later CoCo 2s supported lower case text characters, unofficially. Both of these early CoCos were essentially limited to 64KB of RAM. In many ways, the CoCo 1 and 2 reminds one of the Apple II+. Both machines really had a widespread maximum of 64KB of RAM. They used 8-bit processors running at speeds close to each other. Both machines can produce low resolution direct colors but really show detailed color images with NTSC composite artifact colors. If you subtract the purple/green combination from the Apple II, the graphics of a CoCo and an Apple can look very, very similar. Both machines had somewhat limited (pre-IBM layout) keyboards and did not support lowercase characters officially. Both came with ports for analog joysticks and cassette storage. The sound hardware for each machine was rather crude and neglected. Disk storage was only slightly better on the CoCo. The CoCo 3 was a much more significant upgrade. It came with double the CPU speed, 128KB of RAM and could be officially expanded to 512KB of RAM. There were four extra keys on the keyboard. It had new RGB-based graphics modes which could support 16 out of 64 pure colors and supported several higher resolutions in 2 colors (640x192), 4 colors (320x192 and 640x192) and 16 colors (320x192). The Game Boy was better than its competitors in many ways, more compact, longer battery life, better sound (against Game Gear), more buttons (against Game Gear), higher resolution (against Lynx), lower price, first to market, superior pack-in game. 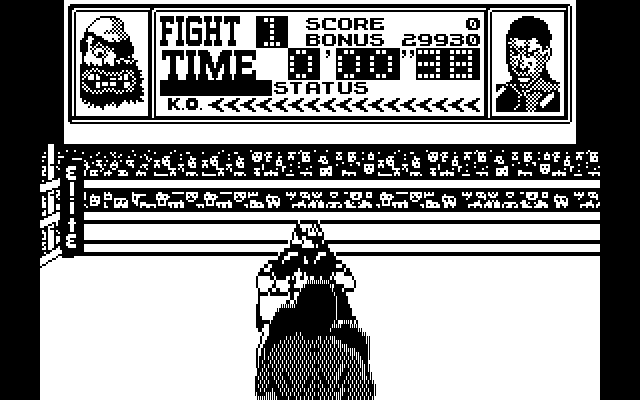 Otherwise, the screen was its achilles heel : poor contrast, four color monochrome, difficulty in displaying fast moving objects and non back-lit. Today we have mods that can fix most of the Game Boy's screen problems. Backlight kits can be installed and the contrast issues can be dramatically improved with a bivert mod. However, these innovations were not available during the monochrome Game Boy's official lifespan (1989-2003). 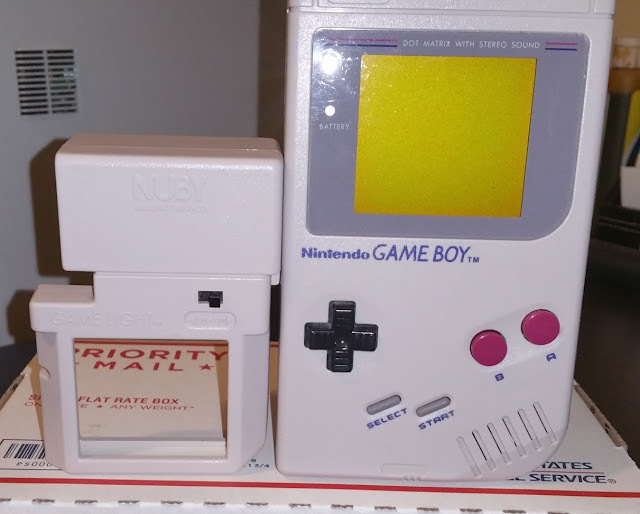 You had to put up with the screen, and the best you could do was either buy a light peripheral or play your games on the non-portable Super Game Boy. 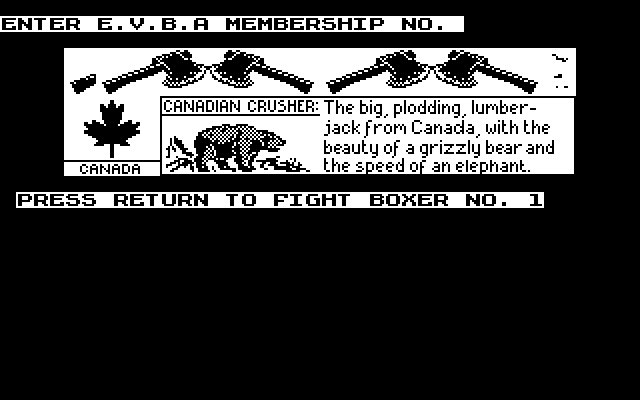 IBM released games for the PC and PCjr. from 1981 to 1985. However, IBM did not always develop the games. These games came in a gray plastic over cardboard folder or folio without artwork on the covers. The game and manual would fit into plastic sleeves on the inside of the folder. The disk label was originally gray, but turned to red for Casino Games. These were the among the first commercially sold games released for the PC. Arithemitic Games Set 1 - Science Research Associates, Inc.
Arithemitic Games Set 2 - Science Research Associates, Inc.
Microsoft Adventure was the first commercial PC game ever released, it was available at the PC's launch, August 12, 1981. 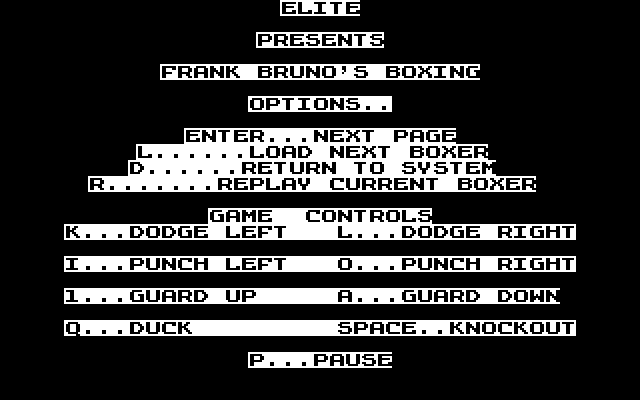 The first actual PC game was the Donkey game included with PC-DOS 1.0 and run in BASIC. One Hundred and One Monochrome Mazes is the first non-text game released exclusively for the Monochrome and Printer Display Adapter, and only works with that display hardware or compatible hardware. It does not work with the PCjr. It also uses a black folio instead of a gray folio. Microsoft Decathalon does not work with the PCjr. Adventure in Serenia relies on CGA Composite Color and will show incorrect colors with the PCjr. You can run Microsoft Adventure on the PCjr. but cannot set the foreground and background colors. Adventure in Serenia will not show correct composite colors with a PCjr. One of DSI/USI's more competent porting jobs from the late 1980s, Outrun received a decent port to the PC. It was released three times in English-speaking markets. 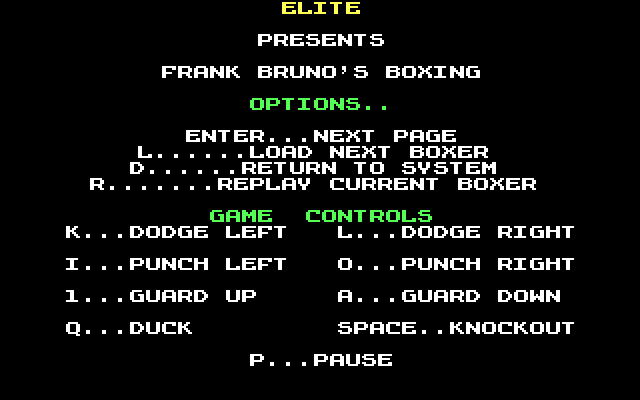 All versions properly support CGA, EGA, VGA and Tandy and a Joystick. I have sample screenshots of the 16-color graphics as displayed on EGA, VGA or Tandy, the 4 color graphics of CGA or Tandy and the monochrome Hercules graphics. I also have attached speech and sound effect sample recordings that played on startup. 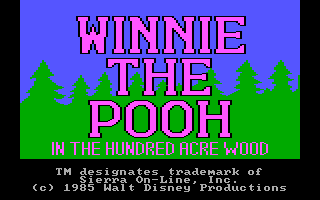 Recently, I learned that Winnie the Pooh had support for Tandy/PCjr. graphics and 3-voice sound. However, whoever was responsible for the colorization either must have had cloudy memories of the Pooh cartoons or problems with perceiving colors. I took a screenshot for each character and tried to make them closer to their colors from the Disney films. I made sure to only use the 16 RGBI colors available to the Tandy/PCjr. and not to do violence to the backgrounds. The real graphics are on the left side, my retouched graphics are on the right side. The Pooh Bear doll only needed to turn the shirt from light magenta to light red. Did you know that you can play all music from Ultimas III-VI on their native platforms without creating a character? Origin pioneered the use of a sound card add-on for music in its games, and for its early games it always had a method to play all the music in a game without having to get into it. However, these methods are not always intuitive, so I will reveal how to listen to the music in each game. You must have a board with at least one AY chip to hear music in any Ultima game. The Ultima games do not use speech chips. Each AY chip gives you three voices. Mockingboard C - Two AY-3-8913 chips and one SSI-263 Speech Chip and a socket for a second SSI-263. The board is the same as the Mockingboard A.
Mockingboard D - An external box containing two AY-3-8913 chips and one SSI-263 Speech Chip controlled by an Apple //c serial port. Not compatible with any games. Mockingboard M - Two AY-3-8913 chips and one SSI-263 Speech Chip, no second socket but does include a mini-jack for audio, bundled with the Bank Street Music Writer. Musically, the Sound II is equivalent to the later Mockingboards, but the stereo may be reversed. Early PC expansion cards either came with no user selectable options, like most IBM's cards, or came with banks of jumpers and dipswitches. Early motherboards also often came only with jumpers to control settings on them. I love these early devices because, if you have the documentation, you always can change the settings and get them to work. IBM's PC, XT, Portable, PCjr and all the Tandy 1000s up to and including the Tandy 1000 TX (but excluding the HX) were all configured in this way. All the major graphics cards and all of Creative Labs sound cards, up to and including the first generation of the Sound Blaster 16, were also configured in this way. Jumpers or dipswitches typically allow you to select I/O addresses, IRQ and DMA usage, among other things. If you think you have a conflict, you shut off the computer, check your cards and make changes to fix the conflict. Turn it back on and if the conflict is solved, it will remain solved so long as the hardware does not change. Occasionally during this period, there were some cards which could be unofficially modded with a soldering iron to give you extra options. Conflicts in the early ISA period were often tricky to diagnose. In the early days, not many people knew what an Interrupt Request was or why their card would not work if another card used the same Interrupt Request. IRQs were the worst areas of conflict because many devices used an IRQ and there were not many which did not have a specified use. Some peripheral cards and software programs would only use the lower eight IRQs. Of those eight, three (System Timer, Keyboard Controller, Floppy Disk Controller) are almost always in use and two more (parallel and serial) are frequently used as well. ISA IRQs are generally not shareable (except for the parallel IRQ when assigned to a printer). DMA usage, even with only four or seven DMA channels, was not usually as bad because so few devices used DMA. I/O port usage was not always given, so if a new card caused your system to crash, it could be due to an I/O conflict. IBM originally only designated 768 valid I/O addresses in the PC design, but eventually the full number of 8086 I/O addresses (65,536) was being used (including by IBM). Finally, there are memory addressing conflicts. If a peripheral card uses the Upper Memory Area for ROM or RAM, it may conflict with some other card which also has ROM or RAM. Some cards, like my ADP-50L use memory addressing to speed up hard disk transfers, even though the card has no RAM, but fail to note which area of memory it is using. An initialization driver was not common in the early days. The BIOS, DOS or the program had all the tools it needed to utilize the hardware. If the BIOS did not have hard drive support, support was added through a ROM extension on a card. EMS memory boards were an early exception, a driver needed to be loaded so a program could address the memory in a standardized way. CD-ROM drivers would eventually follow in this way. Knowing that many people were afraid to take a screwdriver and tweezers to their computers, eventually companies began using software configuration. For systems, this was originally a bootable floppy with a system setup program. This allowed the user to indicate what he had installed in the system and to change system parameters. The IBM PC AT was the first system to allow this, and AT clones thereafter took from IBM's lead. Eventually the IBM PS/2 MCA computers would have peripheral setup disks. You would load the disk and the disk would tell the system that a new peripheral was installed and configure the card entirely in software. The only problem with this is that if you lost the setup disk, you were SOOL. Also, it really stunk if your CMOS battery expired. The system would store its configuration in the CMOS and when the CMOS died, you would start getting dreaded "161" or "163" errors. At worst, the system would fail to get past the boot screen at all. Some other systems, like the later Tandy 1000s store their settings in a small EEPROM. Eventually, this software configuration concept made its way to ISA cards. The Gravis Ultrasound was partially software configurable. While you selected the card's I/O address via jumpers, you set its IRQ and DMA selections by an initialization program (ULTRINIT.EXE) that loaded every time you booted the system. The second generation Sound Blaster 16s and first generation Sound Blaster AWE32s also used a similar program (SBCONFIG.EXE or DIAGNOSE.EXE). The Gravis and Creative programs would be loaded in AUTOEXEC.BAT and take the settings from the SET BLASTER or SET ULTRASND lines in AUTOEXEC.BAT. The Mediavision Pro Audio Spectrum series used a device driver called MVSOUND.SYS, loaded in CONFIG.SYS with parameters, to initialize the card. Ever desiring to make hardware more friendly to users, especially when PCI cards rarely if ever had jumpers or dipswitches, the ISA Plug-N-Play standard emerged. This standard mandated that virtually everything be configured by software in a standardized manner. If you had a Plug and Play OS like Windows 95, you would configure your cards in System Properties. If you were still using DOS, you had to run a program that gave you the functional equivalent. Sound Blaster cards had a program called CTCU.EXE which could configure any ISA PNP card, not just a Sound Blaster card. Popular Sound Cards with PNP support include third generation Sound Blaster 16s, second generation Sound Blaster AWE32s, all Sound Blaster 32s and AWE64s. The Gravis Ultrasound PNP, the various Yamaha, Crystal and ESS ISA chipsets all seem to be PNP. They all require drivers to initialize the card and to change settings. Loading these drivers in DOS can add quite a bit to the boot time. Even if the card's drivers are properly loaded in Windows, you will still need to load the card's DOS drivers. ISA Plug and Play would gives you resource configurations. Some of these configurations would allow you to manually assign resources to the card and sometimes they would not. Sometimes they would delete resources or assign resources in a very odd way. Often it was quite a struggle to get some cards working at the resources you wanted as opposed to what the driver assumes everybody wants. With PCI cards came the end of much of the hassle of assigning resources and managing resource conflicts, whether on the card or in software. Windows 3.1 had begun the requirement of drivers for various hardware, but Windows 95 took it to a whole new level. While there would occasionally be a resource conflict, PCI cards were typically well-behaved and focused on configuring options instead of resources. 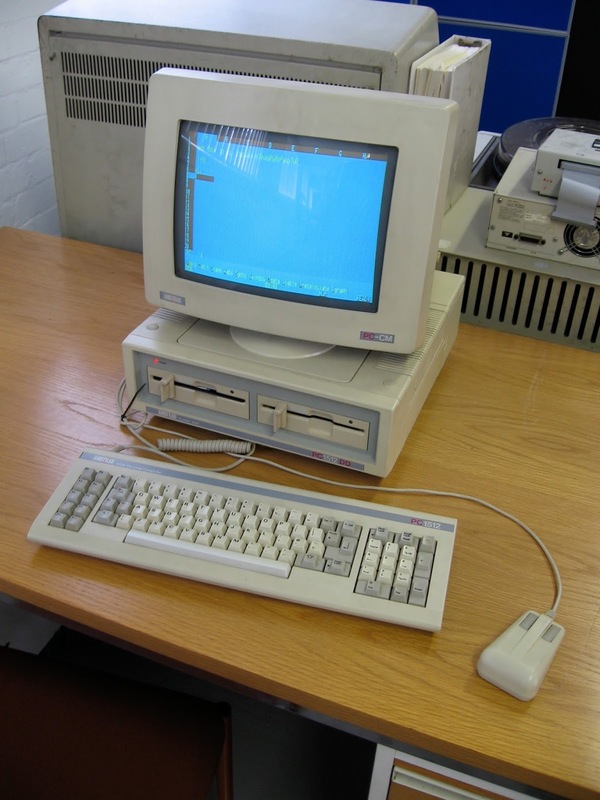 In 1986, Amstrad released the PC-1512 for in the United Kingdom. Amstrad was a leading manufacturer of home computers, having launched the successful CPC series and by 1986, having bought Sinclair Research and would release more computers in the ZX Spectrum line. However, both the CPC and Speccy's were known more for and better at playing video games than serious work. Unfortunately, the standard business computer of the day, the IBM PC and clones, was very expensive. The cost of a minimally configured PC compatible or clone was well out of the price range of most European consumers. Neither of Amstrad's key computer lines were IBM PC compatible so Amstrad decided to design their own PC Compatible. The solution they came up with was innovative in many ways but a bit limited in others. Enter the PC-1512. The Amstrad PC-1512 uses an 8086 CPU running at 8MHz like the Tandy SL, SL/2 or the IBM PS/2 Models 25 & 30, but it came earlier than either machine. The CPU is in a socket, so it can be upgraded to a V30 for increased performance. The stock system came with 512KB of parity memory, which was very reasonable for a low cost PC clone at this time. (The Tandy 1000 EX and HX came with half that and the SX came with 384KB, all non-parity). The RAM can be upgraded to 640KB with eighteen standard 64Kx1 DRAMs, 150ns or better. It also has a socket for an 8087 Math Coprocessor and a built-in floppy controller with DMA. The PC-1512 came with one or two half height 5.25" drives, and in this regard looks very similar to a Japanese NEC PC-8801 or 9801 machine. The keyboard is based off the IBM 83 key keyboard with many improvements to the layout. It has 85 keys and looks like an IBM PC AT keyboard. Apparently the PC-1512 was released in the United States, but it was not popular. Likewise, the Tandy 1000s were released in the U.K. and Europe, but were not popular. The US and UK keyboard are almost identical and the UK keyboard is rather US friendly in terms of key layout. The keyboard is not compatible with any IBM-compatible keyboard, but there does exist at least one compatible 102-key keyboard. Early Northgate Omnikey keyboards also have Amstrad compatibility with a special cable. Input was also very innovative for the time. The system came with a mouse out of the box, which was always a separate purchase for other IBM PC compatibles of this time. The Amstrad mouse is extremely ugly looking, even by the miserable mousing standards of the 1980s. It looks like the designer was inspired by the Moai statues of Easter Island. You should be able to build an adapter to allow a bus mouse which sends pure quadrature signals to work in the PC-1512. I believe an Atari ST mouse may also be compatible. I'm not sure about an Amiga mouse. Expansion is pretty decent. There is a standard 25-pin serial and parallel port on the back and three slots inside the machine for ISA expansion cards. The keyboard connects to the machine via a 6-pin DIN. Next to the keyboard port is a DE-9 mouse port. The mouse is a proper rotary optical mouse, but the two mouse buttons are redirected to the keyboard port. The keyboard will report the mouse buttons as otherwise unused raw keyboard scancodes. Of course, with the proper mouse driver, this should be transparent to the user. If you want to assign the mouse buttons to a particular keyboard key, you have that option. Even more interesting is the Amstrad joystick, which attaches to the keyboard via a DE-9 port. The joystick pinout is compatible with standard Atari joysticks, but also can support a second button on pin 7, which is not particularly standard (Genesis and Master System controllers use Pin 9). This is a digital joystick, which is a first in the PC world. The keyboard treats the joystick simply as six extra keys, giving a unique raw scancode to each key. The built in firmware translates the joystick directionals to cursor keys but the buttons can be user defined to produce the translated scancode of any key. The Amstrad can also use a standard IBM PC compatible analog joystick with a standard Game Card or a Sound Card. This feature was carried over to the PC-1640. Like the Tandy 1000 EX and SX, the Amstrad has a volume control for the internal speaker. The dial is accessible outside the machine, like the EX. The SX's volume dial is inside the machine, an issue fixed with the TX and HX. There is no additional sound hardware outside the main PC speaker unless you add a sound card. The Amstrad came with one or two 5.25" 360KB drives. Upgrading the drives to 720KB can be done. The data separator in the PC-1512 cannot handle the 500kbits per second speed required for high density drives. In addition, Amstrad drive cables are untwisted, so you will need a way of setting a modern 3.5" drive to DS0 instead of DS1 for the A: drive. You do not need to do anything for the B: drive in this case. Installing a hard drive into one of the bays was a standard, if expensive, option. You would need to add a hard drive controller card into one of the expansion slots or use a hard card. The Amstrad can accept a 13" expansion card, unlike the Tandys. The Amstrad had a built in real time clock and CMOS RAM. It is a standard HD146818 like the one used in the IBM PC AT and powered by 4xAA batteries instead of coin cells, barrel batteries, or the Dallas Smartwatches. The CMOS setup is pretty basic, but is used to assign the number of disks, starting text/graphics mode, initialize serial port parameters and can be used to assign a keyboard translated scancode to the joystick and mouse buttons. Tandys of the time required an upgrade for a RTC, either being fitted underneath a ROM chip or on an expansion board. Most PC compatibles had a fan for the power supply. Early PC1512s did not come with a fan, even for the power supply. The reasoning was that the inclusion of the power supply in the monitor allowed for adequate cooling by natural convection. However, when rumors of unreliable machines popped up, Amstrad put in a fan. The Amstrad came with MS-DOS 3.2 and Digital Research DOS Plus, the latter of which can run MS-DOS or CP/M applications but was slower. It also came with DR's GEM graphical user interface and the GEM Paint program. The Paint program supports 640x200x16. Tandy provided something similar with its Deskmate II software with the SX, but Deskmate II gave only a text-mode based interface. The EX's Personal Deskmate used a true graphical interface but it was fairly limited. The 1512 has a special CGA-style monitor. This monitor comes in monochrome and "colour" varieties. This monitor is unique to the 1512 because it provides power to the system unit. No monitor = paperweight. The monitor provides power to the system unit via a very unusual DIN-14. The system unit provides video to the monitor via a DIN-8. This DIN-8 combines H-sync and V-sync on one pin, standard CGA separates the H and V signals into two pins. The signals for the R, G, B, & I signals are still digital. The Amstrad does not have composite CGA output, so the monochrome output is digital and uses 16-shades, giving sharp and distinct image quality. CGA compatibility on the 1512 is nothing to write home about. The standard BIOS-compatible CGA modes are supported as is the 160x100 "graphics mode" and the alternate cyan/red/white palette. Composite color is not supported because the PC-1512 was designed in and marketed mainly for PAL countries and CGA composite color was NTSC based. The MC6845 is only emulated and the emulation is not 100% compatible. The built-in CGA cannot be disabled, so EGA and VGA will be limited to monochrome modes. A Hercules or MDA card will work alongside the Amstrad's CGA, but you will need a separate monitor. A Hercules InColor card will also work to provide high resolution color output, but little software supports it. Amstrad CGA has two or three text mode fonts built in, selectable by a jumper on the motherboard. Normal/Codepage 437/English is the default, Danish is also available as is Greek on later 1512s. More important is its 640x200x16 graphics mode. This graphics mode is unique to the 1512. 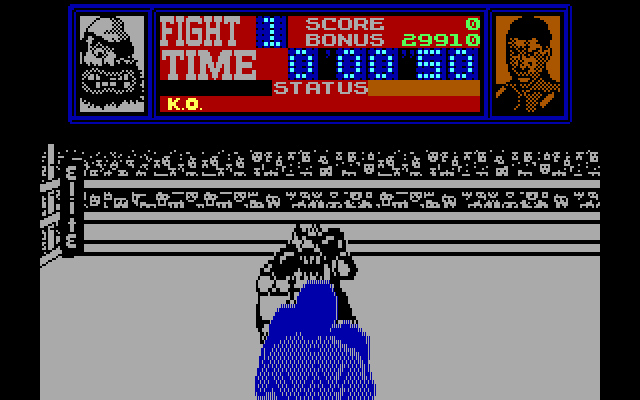 However, few games ever took advantage of this high resolution graphics mode. MobyGames indicates that 21 games support Amstrad graphics, but this does not mean these games support the 640x200x16 Amstrad graphics mode. The Lemmings games do not. Iznogoud does not, nor do the two Passenger on the Wind games. While they do have Amstrad selections, I believe this is to ensure compatibility with CGA graphics, not to implement extra color. Almost all of these games support EGA and sometimes even Tandy or VGA. All of these games come from European publishers and except for Lemmings they are very obscure by US standards. The 640x200x16 mode's implementation is unique to the Amstrad PC-1512. Its successor, the Amstrad PC-1640, has built-in EGA graphics in place of the PC-1512's graphics controller. The 16-color PC-1512 graphics mode did not receive BIOS support. Neither did the 640x200x16 mode with the later Tandys. It requires 64KB of RAM, but the controller only provides a 16KB window into video memory. In this 640x200 mode, the window is assigned to one of four 16KB bitplanes, with each bitplane representing one of the four RGBI components. You select each bitplane then write that component's bits. On top of this, the Amstrad's CGA graphics may be the slowest graphics adapter of all time (next to the PCjr.) Topbench's benchmarks show the speed of the Amstrad as significantly lower than a CGA card in an IBM PC or the Tandy graphics adapter in an Tandy 1000SX. Given that you cannot disable the built-in graphics, you are almost always stuck with slow 4-color CGA graphics. The Technical Reference states that the CPU has wait states inserted when accessing video RAM to maintain synchronization with the graphics controller and the number of wait states (12-46) seems rather high. One thing I had forgotten about until writing this article was that Sierra offered support for the 640x200x16 mode in its SCI0 and 16-color versions of SCI1 games! With a driver called PC1512.DRV, you could obtain a proper, effective 320x200x16 resolution in Sierra's games. In order to achieve this, each pixel is written twice horizontally. This driver rarely can be found with the actual games themselves, but here is a place to download the driver : http://sierrahelp.com/Patches-Updates/MiscUpdates.html The SCI games run a tad slow on the PC1512. As far as AGI games go, there is no Amstrad driver and you are limited to 4-color CGA at best. So, in order to get the functional equivalent of the Amstrad's Color Dual Drive features (except for CPU and RAM), you would need to spend $1,793.75 at Radio Shack on the SX. Of course, you could often find Tandy options cheaper elsewhere. So, it would seem that Amstrad has more advantages. But not all things are weighted evenly. The Amstrad CPU is faster than the Tandy CPU, but the slower switchable speeds of the Tandy makes it more early software friendly. Moreover, Tandy offered the 286 Express upgrade (at 299.95) that would propel the Tandy beyond the Amstrad. 8086 machines had no such upgrade generally available. The maximum amount of RAM is the same, but the cost of eighteen 64Kx1 chips for the Amstrad was probably roughly equivalent to the cost of eight 256Kx1 chips for the Tandy. Amstrad's keyboard has a better layout than Tandy's. The keys are more spread out and areas more clearly defined. Tandy's keyboard has everything mushed together and the extra keys are seldom used. Amstrad's parallel port is standard, Tandy's is not and is missing one of the control lines. The serial port in the Amstrad is a welcome feature, Tandy requires an upgrade that takes up a slot. Cheap these days, however. A dual serial card will give you a mouse interface for the Tandy, making Amstrad's mouse interface no longer much of an advantage. Music is clearly superior from the Tandy machine, 3-voice music was supported in hundreds of games and usually sounds decent even when the game supports Adlib music. Expansion slots are typically a wash, you need at least one slot on the Tandy for a mouse interface. Amstrad will have no problem with Expanded Memory Boards, but there are modern Expanded Memory Boards available from Lo-tech that fit inside Tandys. Vintage 8-bit EMS boards are overpriced. The Tandy 1000SX has its power supply built in and you are not tied to two specific monitors. They can also use NTSC-compatible composite monitors and TVs when nothing better is available. Tandy's video slaps down Amstrad's video. Tandy's video is much more CGA compatible and is far, far faster than Amstrad's. Hundreds of games use 320x200x16 and 160x200x16 Tandy graphics, almost none use Amstrad's Enhanced 640x200x16 graphics. You can easily upgrade to an EGA or VGA card in a Tandy SX, you cannot in an Amstrad. When New World Pictures (NWP) was developing "The Return of Godzilla" into "Godzilla 1985", it made a deal with the soft drink maker Dr. Pepper. Dr. Pepper was conducting an advertising campaign at the time where commercials showed Godzilla being destructive until calmed by some Dr. Pepper. NWP was a smaller studio which could use all the publicity they could get to advertise the film they were going to release into theaters in the summer of 1985. NWP made a deal with Dr. Pepper, Dr. Pepper would shout out the film in their advertising campaign and NWP would conspicuously engage in product placement for Dr. Pepper in its film. http://hkfilmnews.blogspot.com/2007/10/godzilla-1985-widescreen-on-monsters.html, but none that would affect this particular issue. With a copy with which I could easily manipulate the playback, I counted exactly four instances where Dr. Pepper is plugged. The first instance is the scene introducing General Goodhue and Major McDonough at 18:02. There is a Dr. Pepper vending machine in the middle of the background as the camera tracks the two men down the hall. The scene with the vending machine visible lasts 26 seconds. The second instance is at 30:52 when Steven Martin's grandson is playing with his toys. 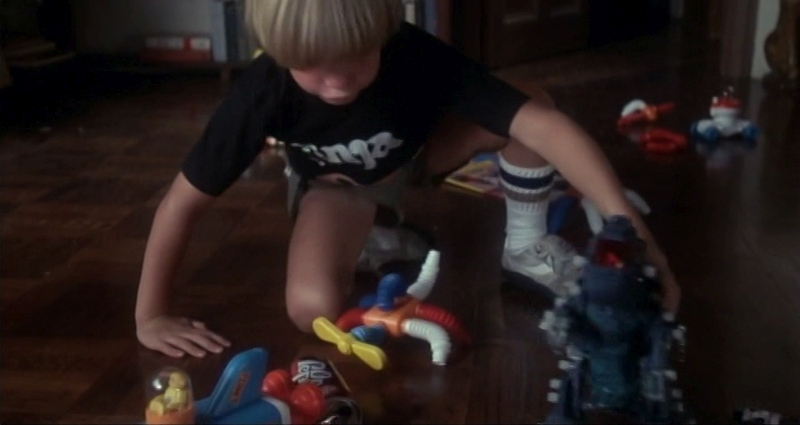 A can of Dr. Pepper is among his toys and gets knocked around. The can is visible on screen for about 13 seconds and can be seen in two shots. 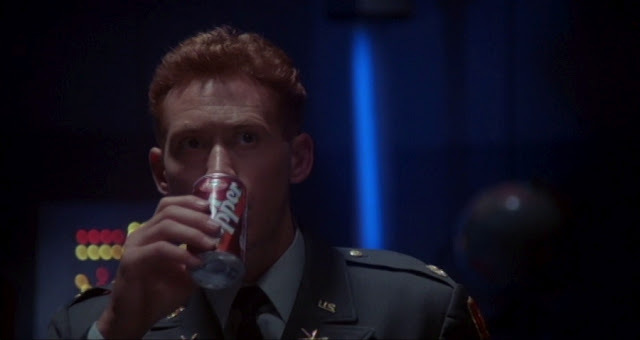 The third instances is of Maj. McDonough taking a drink from a Dr. Pepper can at 1:18:59 and is visible for about 2 seconds. 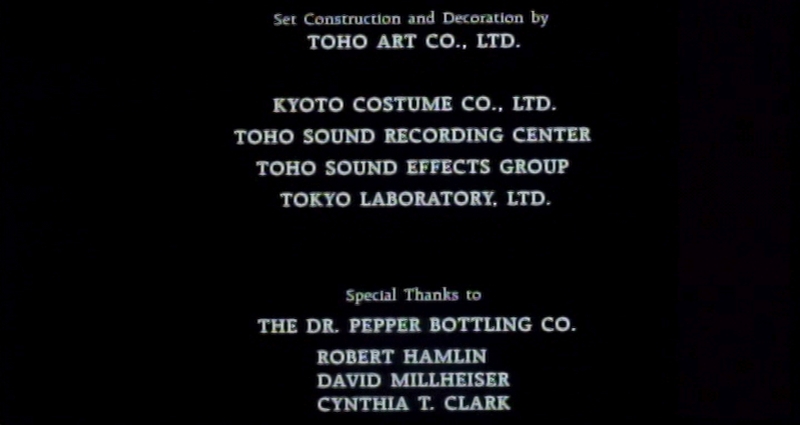 The final instance is a Special Thanks to "The Dr. Pepper Bottling Co.", among others, in the credits. The credits last for 2m50s and the text can be seen for about 10 seconds, just like any other line. I am Godzilla, you are Japan! I would note that the filmmakers took steps to avoid overly gratuitous use of Dr. Pepper. 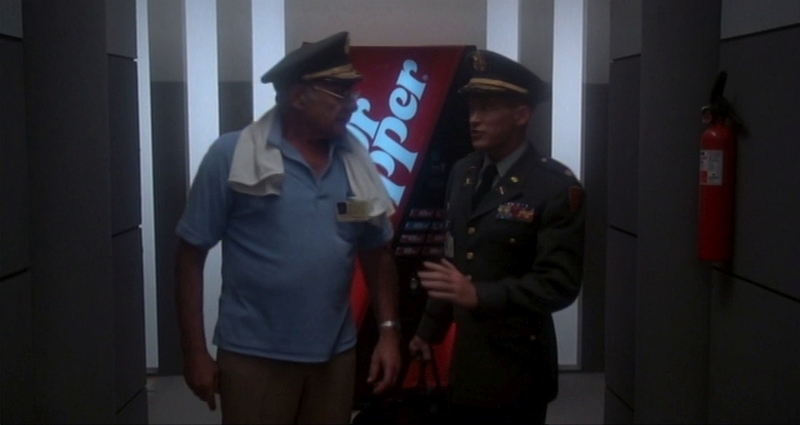 They determined that it would not be unreasonable to have a vending machine in the office building like the Pentagon, so they set it in the hallway scene with the General and Major. However, it would have been crass to put the machine in the Command Center itself where most of the rest of the subsequent US footage would be shot. Dr. Pepper is not the only beverage shown to be consumed in the film, even in the later-added US footage. The General is shown drinking coffee twice. 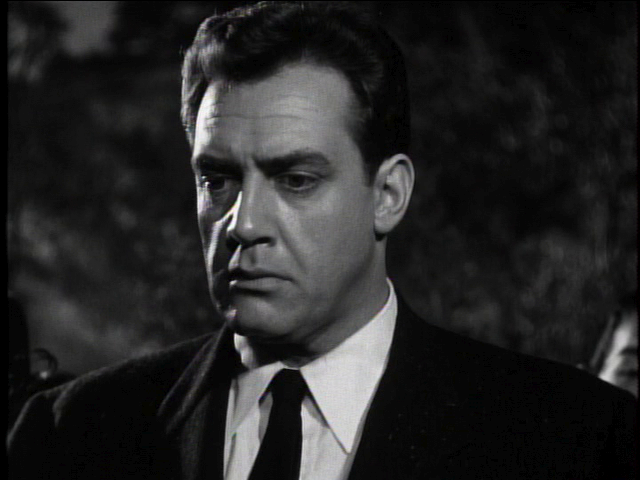 Although US Director Kizer tried to get Raymond Burr to take a drink of Dr. Pepper on film, that was not about to happen. Is Dr. Pepper is the reason why this guy is such a dweeb? The scene with the vending machine has the longest shot of any of the Dr. Pepper instances, so I think it is worth some attention. If this film was being made in 2015 instead of 1985, a more conscious effort may have been made to emphasize the machine. One way would be for the General and the Major to stop to have their conversation in front of the machine with each actor standing on either side of it. Another way would be for the General and the Major to walk toward the machine with the camera following them, allowing the machine to gain more prominence as the men get closer to the Command Center. In the existing scene, the camera pulls away from the machine. 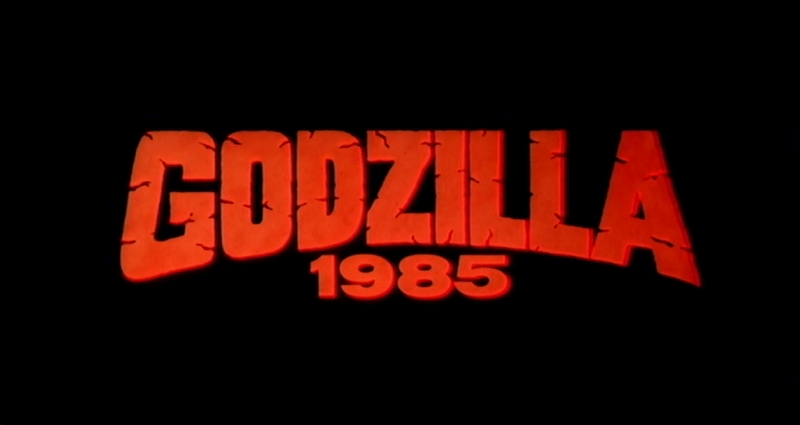 Godzilla 1985 is 83 minutes long between the opening titles and closing credits. The US version added about 10 minutes to the film's runtime and the remainder is from the original The Return of Godzilla (which is 103 minutes long). While Dr. Pepper did exist in Japan, it was nowhere near the most popular soft drink there and it is not present in the Japanese film. The Japanese film released in December 1984 and only after that did NWP obtain the rights to recut and release the film in the US. 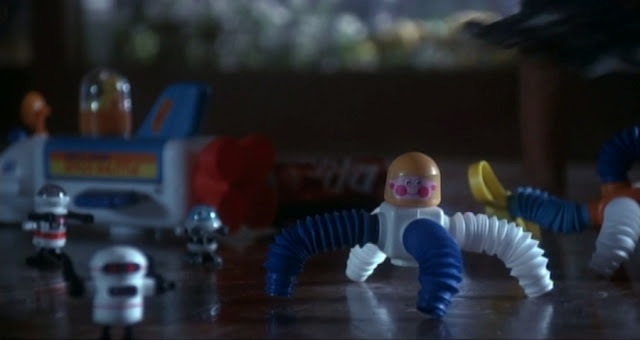 In the context of the complete film, Dr. Pepper has only a very minor presence. I would not have been surprised if the Marketing people at Dr. Pepper, after viewing the film, were a little disappointed. They probably would have expected a few more shots with a Dr. Pepper can in it or perhaps a second scene in the hallway, preferably with Burr in it. However, for NWP, it was a small price to pay for some very generous support from a national brand. 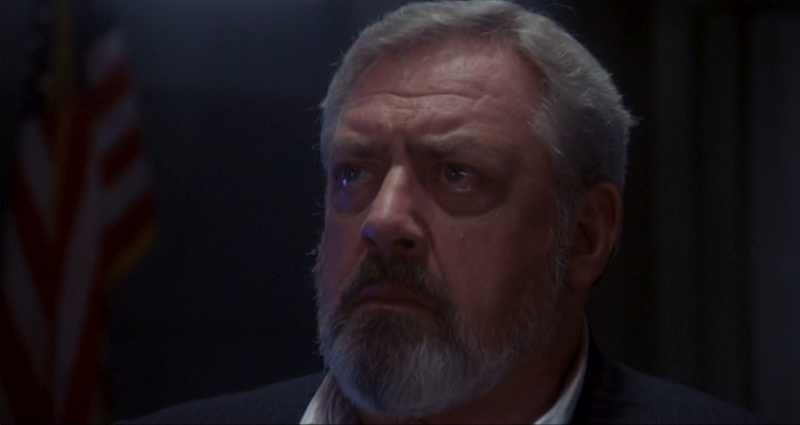 NWP made an inspired decision to bring back Raymond Burr and his character, who had been introduced in Godzilla, King of the Monsters in 1956. Burr treated Godzilla seriously and brought the same gravitas to the role 30 years later, now with the added years. Whatever his faults in his personal life, (his own accounts of his personal life were filled with fiction), Burr always took acting seriously and never gave an undignified performance. His presence helps keep the grim tone of the original The Return of Godzilla intact between the Dr. Pepper plugs, the goofy comedy relief provided by Major McDonough and the dubbing. The Return of Godzilla sans-Pepper & Burr is a bit dull by comparison. When Sony localized Godzilla 2000, even the decent dubbing and judicious trimming could not quite make up for the absence of Burr and new American scenes. 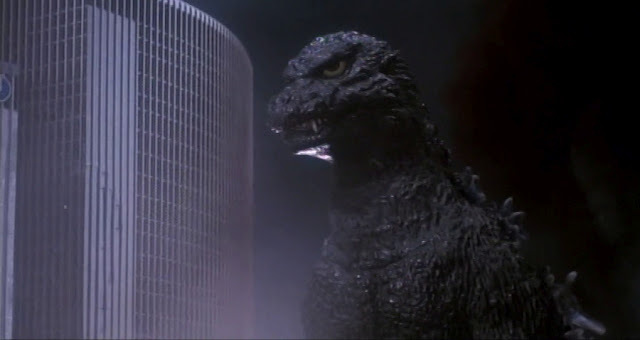 Although Burr is frequently referred to as "Steve" or "Steve Martin" and never as "Steven" in Godzilla, King of the Monsters, the shorter "Steve" is never used in Godzilla 1985. This was to avoid any association with the comedian Steve Martin, who was some years away from being known for his fine dramatic skills. Burr's character's first name, "Steven", is only given in the credits and in the script. In the film itself, he is always referred to as "Mr. Martin" except in one instance. In fact, when he introduces himself to the General, in the script he is supposed to say his full name, but in the film he just says "The name is Martin, you asked for me to come here." It is worthy to observe that Godzilla portended good things for Burr after both times he appeared in a Godzilla film. When he appeared in Godzilla, King of the Monsters in 1956, his mainstream breakout role in Perry Mason was very close at hand. Godzilla, King of the Monsters had premiered in April, 1956 and Burr had won the role in TV series Perry Mason by the next month I'm sure the financial success of Godzilla, King of the Monsters did not hurt his chances or make the producers of Perry Mason reconsider their choice. Burr's film appearances virtually disappeared for the next twenty years between Perry Mason and Ironside. However, after Ironside his subsequent TV shows failed and he was not in huge demand in feature films either. When he was working on Godzilla 1985 he was simultaneously working on the first Perry Mason TV movie. It premiered at the end of December, 1985 and it was so successful to launch a series of twenty five more TV films, an Ironside Renunion film and four more "Perry Mason Mystery" films after Burr's death. He only made one more film appearance after Godzilla 1985, ultimately it is his work in TV and in Godzilla films (and portraying the villain in Hitchcock's Rear Window) for which he will be most remembered.